You are here, according to Herb Lester. When we came across UK-based Herb Lester Associates, it was love at first sight. 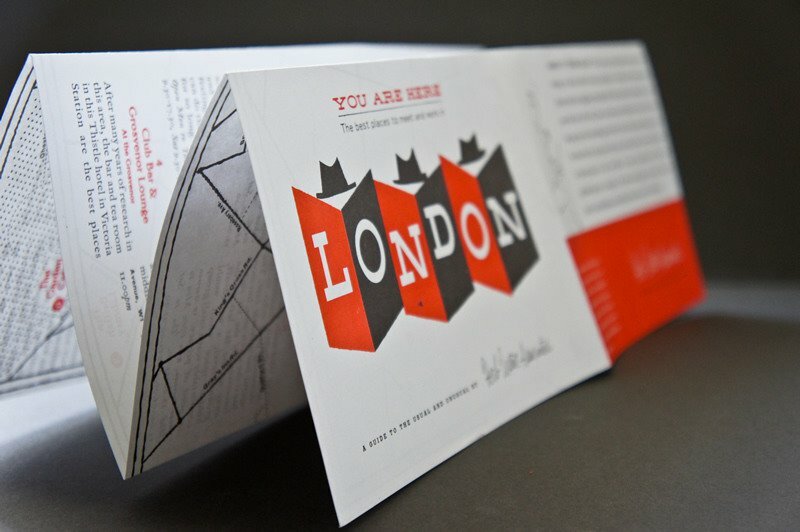 The retro-looking city guides come in the form of portable maps with quirky themes like It's Nice to be Alone in Paris and An Uncle's Guide to London. Founders Ben Olins and Jane Smillie write, research, and collaborate with notable designers from around the world to produce the refreshingly affordable and beautifully illustrated series. We asked the duo behind the company about their hometown favorites. Tell us about your maps: We call them guides to the usual and unusual. The places we choose to include are not deliberately odd or offbeat, nor are they limited to major tourist sights. We try to find a different approach to the familiar, as well as highlight lesser-known or neglected spots. Who is Herb Lester? He's whoever we need him to be at any given time: taskmaster, sage, confidant. It all depends on what we require of him. Each map is illustrated by a different artist. How do you decide on who to work with? We have a long list of illustrators whose style we admire. In the past we've created maps with Mike McQuade, Ed Nacional, and Jim Datz. We try to choose people who have a relationship of some sort with the city. Where is your office located? Shoreditch, East London. What should we know about the neighborhood? That it's changing all the time, and not always for the better. The glass and steel of the big banks are rising all around, and with that comes more big brands and less space for smaller businesses. Best spot for people-watching: From the top of a red double-decker bus. Your favorite lunch spot: We have a weakness for the duck banh mi sandwich at Kêu! on Old Street. The route for your favorite city joy ride: Walking through Regents Park at any time of year is always uplifting. Where do you go when you want to be in the middle of it all? That's not really a choice in London — you're always in the middle of it all. That said, walking across the bridge from Embankment station to South Bank gives an exhilarating sense of being at the center of the vortex. Where do you go when you need an escape? Despite overcrowding, noise, traffic, pollution, and general intensity, there's always a park nearby to sit quietly and collect your thoughts. Some are scrappy little patches, like St John's Gardens by Farringdon Station, which is a nice surprise tucked away down a side street. There are more picturesque places like St-Dunstan-in-the-East, a ruined, roofless church-turned-garden. Most underrated thing in your city: The buildings above the shops. Look above the shop signs on any high street and see extraordinary things that few people ever notice. It's not about setting out to look for them, the pleasure is in spotting them unexpectedly. There are cupolas, gargoyles and weathervanes, Masonic symbols placed by long-dead builders, and ornate tile-work. Even the most glamorous streets have their share of dusty flats and offices with grimy curtains, all of which seem to have a sad story to tell. Favorite local shops? There are so many that we made a whole map of them, which we called May We Help You?. Two favorites that didn't make it onto the map are Camden Coffee Shop on Delancey Street, where we buy our coffee beans, and Gardner's Market Sundriesmen on Commercial Street, which is close to our office. Paul Gardner is the fourth-generation owner of this fantastic shop. We buy all our paper bags there, as should everyone. Both shops, without any artifice, have a sense of being from another time. Their old-fashioned appeal is not about nostalgia, but the simple pleasure of dealing with knowledgeable, friendly people doing their job well. You dream about your meal at Moro on Exmouth Market, and think often of the roast duck at HK Diner on Wardour Street, and the lamb chops at Tayyabs in Whitechapel. Favorite local icon/monument/institution? E Pellicci, a family-run Italian-English cafe with beautiful art deco decor, home-cooked food, a friendly atmosphere, and wonderful eavesdropping. These days in London everybody's talking about the upcoming Olympics. What is your favorite London guide (aside from your own, of course)? What's Where In London with BP by Denys Parsons, published in 1961. An idiosyncratic guide to shops and services, wonderfully written and wittily illustrated. Best book or movie or song based in your fair city? An impossible question, but a few favorites include: George and Weedon Grossmith's Diary of A Nobody, Graham Greene's The End of the Affair, The London scenes in The Ipcress File are wonderful, 1960s Soho in The Small World of Sammy Lee and Expresso Bongo, The Rolling Stones' Play with Fire, and The Kinks' Dead End Street. Best way to pass an evening: The Southampton Arms on Highgate Road, with pork pie and a pint of something tasty. No trip to London is complete without walking in The Royal Parks, a visit to Victoria & Albert Museum and, at the very least, a glimpse of the Thames. Check out Fathom's guide to the city.